So the festive season is well and truly over. All the Christmas decorations have been taken down, all the gammon leftovers have been eaten, and everyone is talking about good intentions, more exercise, losing weight, drinking less and eating light. Going out to dinner with friends has become fraught with difficulties as this one won’t go to a pizza joint (“I’m off carbs”), that one won’t go to a steak joint (“I’m trying to keep vegetarian this month”) and nobody will share a bottle of wine with me as half the world seems to by trying to have an alcohol-free January! And having people round for a meal is no less complicated, as endless lists of things friends aren’t eating find their way into my inbox while I am finalising the menu. I am not into culinary self-denial, and I refuse to serve my friends a bowl of bean sprouts when they come to visit, so the search has been on for diet-friendly but still tasty foods to take the edge off January’s self-imposed food restrictions. Remember last year I posted about my friend Kalyn’s spicy roasted chickpeas? As I said, the spice mix makes a lot more than you need for the chickpeas, so I kept the extra spice and kept finding uses for it – most notably as the perfect spice mix in which to toss vegetable chunks prior to roasting! Roasting vegetables is almost always my favourite way to cook them as I love the concentrated flavours that roasting produces, and the fact that once the chopping is done, you don’t have a lot to do and can focus on other things. The vegetables that you use are open to your interpretation – these are just the ones I happened to have in my fridge on the day I made this. On their own, these Moroccan-spiced vegetables make a delicous side dish; or served on fluffy couscous, they make a vegan (and diet-friendly!) main course for the fussiest eaters. I am repeating the spice mix recipe here and I would highly recommend keeping some of the mix permanently in your spice rack (in an airtight container) to sprinkle on anything from chickpeas to potatoes to chicken. it’s the perfect thing to add a little spice to an abstemious, grey January. Chop all the vegetables into bite-sized chunks and place in a bowl. Add a good glug of olive oil and 2-3 tablespoons of the Moroccan spice mix, depending on how spicy you want your vegeteables. Using your hands, toss the vegetables in the oil and spices until they are thoroughly coated. Turn the vegetables out onto a foil-lined roasting tray and plae in the centre of the oven. Roast for about 40 minutes, or until the butternut squash chunks are tender. 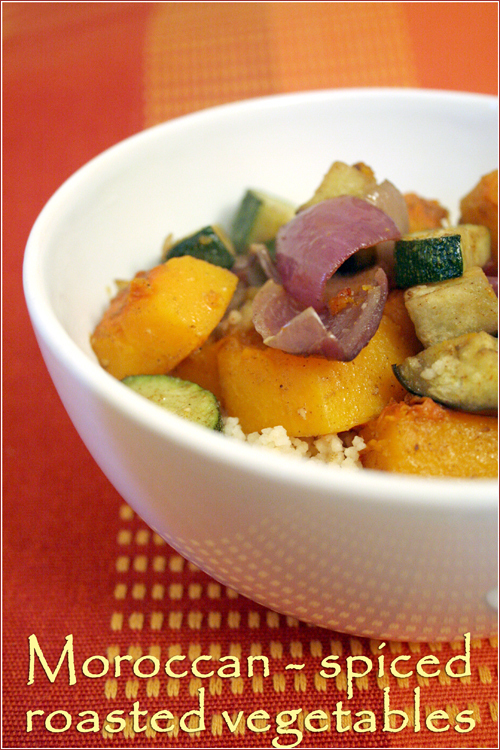 Serve on couscous, or as a side dish with chicken or fish. I’m on a quest to cook up a middle eastern feast. This looks lovely….great colours and mix and with some bread…..I would go to bed, quite happily!!!!!!!!! And agree with you – there’s NO need for the bean sprouts!!!!!! i am glad that the feasting and fattening time is over. 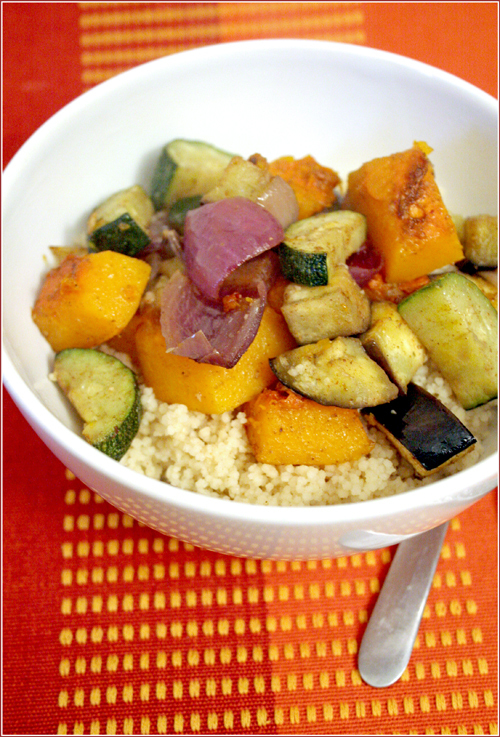 i love simple vegetable dishes like this – vegetables, spiced in perfect harmony and a bowl of couscous. just my kind of comfort food! That looks very tasty. I love roast squash and aubergine. Roasted vegetables are so reminiscent of Summer to me that I don’t think to cook them in Winter, I can see how the spicing would make this a perfect dish for these cold evenings now that you’ve suggested it though. I love it when a spice mix has many more uses than the recipe it’s for. I’ve almost been tempted to scale down to imaginary fractions of teaspoons just so I don’t waste anything 🙂 This is a great combination of veg, I love it! I love, love, love roasted veggies. Yum. Jamie Oliver once suggested Moroccan spices for them and I tried it and never roasted without them. Divine. This sounds very very beautiful and colorful and flavorful. Well I love it! These are so colourful as well as tasty when roasted Jeanne. I’d eat pizza with you and bring on the wine…or tequila. What a coincidence! I just threw some Moroccan spiced brussels sprouts into the oven to roast. The Moroccan spice blend is amazingly aromatic. Making my own spice mixes is on high priority these days – ahhh yes, I’m one of those restrictions you love so well (low sodium) add to index please. I’m definitely making this spice mix and I can almost taste the roasted veggies with a kicky spice on them. End of last year Mint&Tea Tagine sent me a box full of Moroccan spices and I have such pleasure using it for all kinds of recipes…Surprisingly enough I have not yet roasted veggies with this spice mix, so this is going to be on the menu very very soon!!! `i’ll totally share a bottle of wine with you and totally hit up a pizza joint and the steak house one after the other! I have no self-control! This looks lovely and I just love veggies purely because they are in fact delicious especially with protein to the side. Definitely checking that recipe out! Was in Morocco in ’01, and need to try to replicate some of the great things I tasted. That was so funny! (talking about your friends trying to “be good”-how futile anyway!). 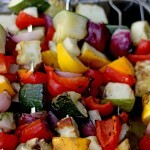 You are so right, roasting veggies is a no-brainer when it comes to eating good stuff, easy to fix! Yummmy and very pretty veggies! I want some now. Kitchen Butterfly – glad we agree on the sprouts. hardly the weather for it! 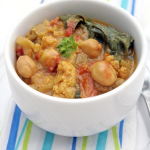 This dish is far more comforting, and still healthy! Meeta – then this is the perfect dish for you! I have to admit that it is good to get back to eating “normal” meals! Kerri – I, on the other hand, never think to roast vegetables in the summer 😉 Clearly, we both need to move more towards the centre of the spectrum! Mark – yes, usually I downscale quantities too, but with this divine spice mix, there is no chance of any of it going to waste! Soma – and the best thing is that you can make it as colourful as you like and use up everything in your vegetable drawer! Kevin – now there’s a thought…! Kalyn – yes, but your “diet” recipes are so tasty nobody will notice that you are dieting! Giz – oopos, yes I am the salt queen I’m afraid. But with spices like this you can actually make do with a lot less sodium! Nina – lucky lady to get a parcel from the lovely Wendy! This mix should make you feel as if you are right there with her in the bazaar. Diva – your Japanese pastry binge has made for fascinating reading 🙂 This is the perfect antidote! Sophie & Juliana – glad you liked it! Oh, I really love this idea of the roasted vegetables. Yum! Great recipe! It’s mouth watering and tempting to eat. It’s mixed of festive Moroccan spices packed with special herbs. This is all very well but has anyone actually tried out this recipe?? If so, how was it? Cooked this last night, added different veggies but used all the spices, had it with the left overs of Quinoa & Beetroot + Garlic yogurt (but added Cauliflower rice to Quinoa) & it was fantastic. Tip, when cooking Quinoa use stock instead of water. 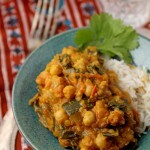 I love Moroccan spices vegetables it is one of my most favorite foods to cook and eat.